GoPatch Motion Sickness patches are an excellent choice for natural relief from vertigo. Vertigo is a sensation of feeling off balance, spinning, or feeling like you are tilting or swaying, sometimes the symptoms are bad enough for a person to become nauseated. In fact, vertigo can feel a lot like motion sickness. That’s why GoPatch patches work so well for people that suffer from vertigo. With its drug free ingredients, GoPatch is the best choice for relieving vertigo naturally. GoPatch Motion Sickness patches work on Vertigo! The most common questions people ask are: “Is there natural relief from vertigo?”, “How to cure dizziness naturally?” and, “Is there a home remedy for vertigo?”. While there is no cure for vertigo or the dizziness associated with it, there are some home remedies that can sometimes alleviate the symptoms. Usually suggested as a home remedy for vertigo are ginkgo biloba, ginger tea, essential oils and acupressure. But beware, some of the recommendations are herbs that can interact badly with some prescribed medications. What is a GoPatch Motion Sickness patch? A GoPatch Motion Sickness patch is a drug-free way to relieve your unwanted symptoms of vertigo. We use a formulation of homeopathic ingredients to create results and give you a drug free alternative to over-the- counter medications. Our patented formula makes it possible to experience natural relief from vertigo and motion sickness. And GoPatch does it without other unwanted side effects, such as drowsiness or dry mouth. Peripheral as well as central are the two classifications of vertigo designated by the medical community. Peripheral vertigo arises from a problem within your inner ear, which is responsible for maintaining your balance. Central vertigo is often caused by a problem within your central nervous system, either from your cerebellum or the brain stem. What Are the Types of Peripheral Vertigo? Approximately 90% of cases are peripheral vertigo. There are various types of peripheral vertigo, which create symptoms such as dizziness and disorientation. The most commonly diagnosed form is BPPV, which often creates quick and frequent episodes of vertigo. Symptoms may arise for only a minute and usually resolve entirely in under 30 minutes. While BPPV is rarely serious, it surely is bothersome. Thanks to GoPatch Motion Sickness patches, you can find drug free and natural relief from vertigo for the annoying dizziness that accompanies BPPV. GoPatch Motion Sickness patches can provide you with immediate relief from dizziness and the nausea that occurs with Meniere’s Disease. If you experience Vestibular Neuritis or Labyrinthitis, then you may feel the symptoms of vertigo for several days. It occurs when the vestibular nerve becomes inflamed, often after a cold or virus. This inflammation causes you to feel vertigo persistently. Acoustic Neuroma is a benign tumor, which impacts the brain’s ability to receive signals from the ear. This health issue can start as a peripheral vertigo concern, then develop into centralized symptoms. The spinning and dizziness sensations can occur frequently. Only a doctor can diagnose you with these conditions. The symptoms of central vertigo occur when something is impacting the physical structures of your brain, specifically your brain stem or cerebellum. Surprisingly, many of the symptoms associated with peripheral vertigo can occur with central vertigo as well. While our GoPatch Motion Sickness patches can help provide relief for your unwanted symptoms of nausea and dizziness that’s associated with central vertigo, there are times when medical intervention should be pursued to treat the root cause. Please consult with your doctor if symptoms reoccur or get worse. Why is a GoPatch Patch Different? GoPatch Motion Sickness patch is different from other over-the-counter products that treat vertigo symptoms. In fact, our patches are the first drug free, all-natural patches on the market. 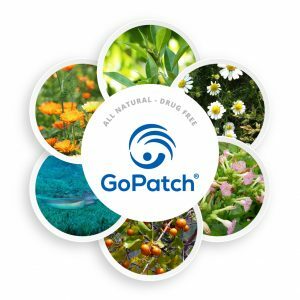 GoPatch patches do not contain any herbal ingredients or chemically manufactured, artificial ingredients that may interfere with prescription medications. There are currently no known side effects when using GoPatch products either. That’s why our patented blend of homeopathic ingredients is your best choice for natural relief from vertigo. Our patches are made in the U.S. in an OTC licensed facility and listed with the FDA. You will just start to feel better! Want a discreet solution? Then you need to reach for GoPatch Motion Sickness patches as we provide just that! Our patches are worn on the navel, hidden from site. Thanks to GoPatch, you can continue on with your day free from those unwanted feelings of dizziness, disorientation, and nausea. Discreet relief is what GoPatch provides. You do not have the same waiting time to experience results either when you use GoPatch Motion Sickness patches to provide relief for your vertigo. Apply the patch when you first feel the symptoms, then start feeling better right away. Are There Other Vertigo Patches on the Market? There are prescription patches available for those who experience vertigo symptoms, such as the scopolamine transdermal patch. You may experience similar side effects when using these patches as you would with over-the-counter treatments because of the pharmaceuticals they contain. Often times people experience hallucinations as well when using these prescription patches. Because these treatments contain antihistamines, anti-emetics, or other treatment options, some people experience a dry mouth, or struggle with stomach distress, which you won’t have when using GoPatch. Commonly, over-the-counter patches may also use herbal ingredients that could interfere with your current medications. That’s why choosing GoPatch for natural relief from vertigo is an excellent choice. You will not feel drowsy when wearing our product nor will you have to worry about our patches interfering with the prescriptions you may be taking. Consider GoPatch as your Vertigo Patch. 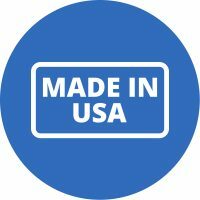 GoPatch Motion Sickness Patches are Made in the USA! Our GoPatch Motion Sickness Patches are 100% made in the USA. We are also listed with the Food and Drug Administration (FDA). Our patches are made according to the same standards used for prescription drugs. We meet all FDA labeling requirements too. An OTC-licensed facility makes each patch we offer for sale. We take these steps because we want you to feel confident that every product of ours is safe to use. How do I use GoPatch Motion Sickness Patch to Provide Natural Relief from Vertigo? Proactive use is the best way to experience the benefits of GoPatch Motion Sickness patch to assist in relieving your vertigo symptoms. Apply it when you know unwelcomed symptoms are developing. You can also apply GoPatch if the spinning feeling has already started, and you will feel relief in a few minutes. Apply a patch directly to your skin over your belly button. Peel the white backing from the patch and place it on your belly button. Make sure to cover your belly button completely. To remove GoPatch as gently as possible, apply warm water to it. Taking a shower, and slowly peeling it back until it releases, is our recommended way to remove the patch and be kind to your skin. Please do not lift and rip off of your skin. Do GoPatch Motion Sickness patches “Cure” Vertigo? A cure for vertigo requires a correction of the issue causing your symptoms in the first place. GoPatch Motion Sickness patches do not cure any conditions. By the same token a home remedy for vertigo does not exist either. Our patches merely provide relief to you during bouts of dizziness, nausea, and disorientation so you can get back to your life, naturally, without side effects. Where can I Purchase GoPatch Products? The best way to purchase GoPatch products is to shop directly from our website. Our items are available through Amazon too for your convenience. You can also buy GoPatch Motion Sickness patches (and all of our other patches) at these locations. I own a retail store: can I sell GoPatch Motion Sickness patches products? Thank you for your interest! We are always open to the idea of working with new distributors and retailers. Do you own or manage a store? We would love for you to sell our products in your store. Then we invite you to talk with us about this opportunity by email at WeCare@TheGoPatch.com. Do you maintain a medical practice? Or are you a spa owner? If you would like to recommend GoPatch Motion Sickness patches to your clients, please do so. If you have any questions about our product please contact us at WeCare@TheGoPatch.com.